Update: Our long national nightmare is over. As of late Monday, Valve has decided to listen to the community and kill off paid mods for Skyrim with an official announcement here. It’s been a long and divisive weekend for PC gaming. Old idols have fallen. Effigies have been burned. Mobs formed. The palace has been surrounded by chanting masses, calling for the king’s head. Or at least calling for the king to maybe, if he would please, change his mind. 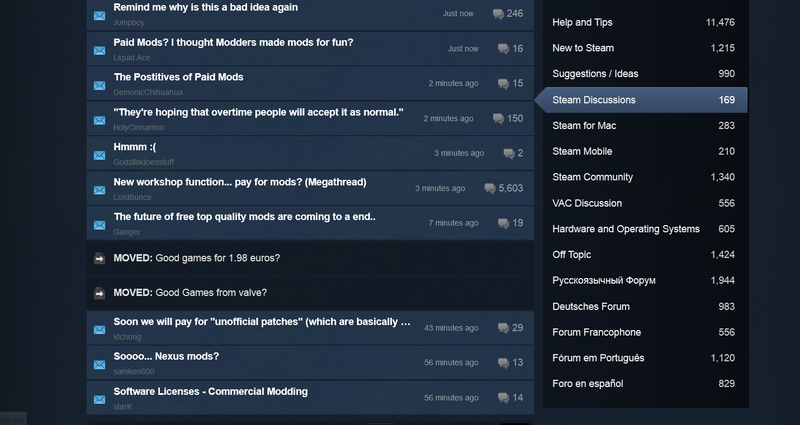 To recap: Last Thursday, Valve announced a new experiment allowing developers of game mods to start charging through Steam Workshop. The experiment-in-question launched alongside approximately two-dozen new “premium” mods for The Elder Scrolls V: Skyrim—a game with one of, if not the, biggest modding communities in the world. And as I noted in our coverage last Thursday, people were by and large not happy with this new development. Mods are one of the foremost advantages to gaming on PC, and traditionally it’s been offered by developers for free—whether out of love for the game or to pursue a professional job in the industry. 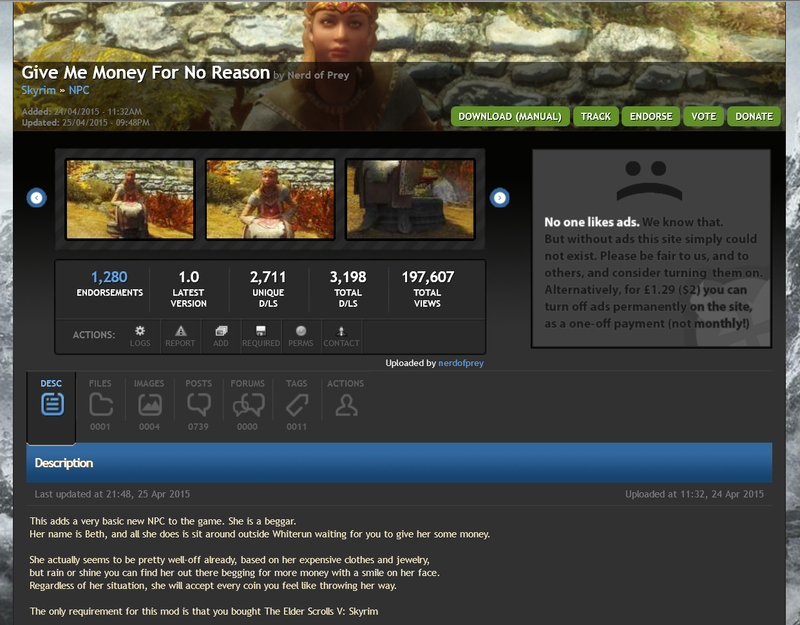 The thought of paying for mods, to many longtime PC gamers, is blasphemy. Not only that, but it opens up a legal and ethical can of worms that it appears even Valve was unprepared for. Below is a relatively thorough recap of all that transpired this weekend. 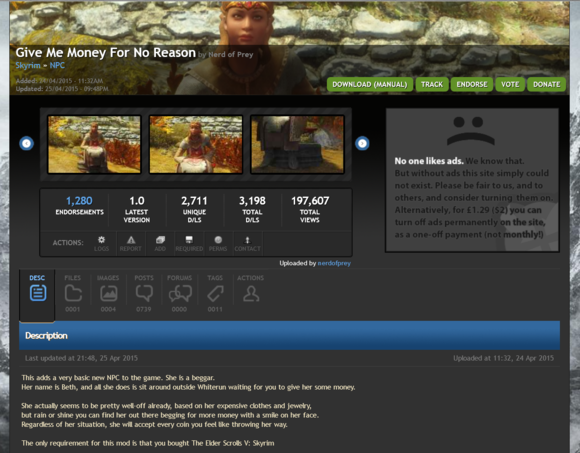 Less than 24 hours after paid mods went live, we had our first casualty. 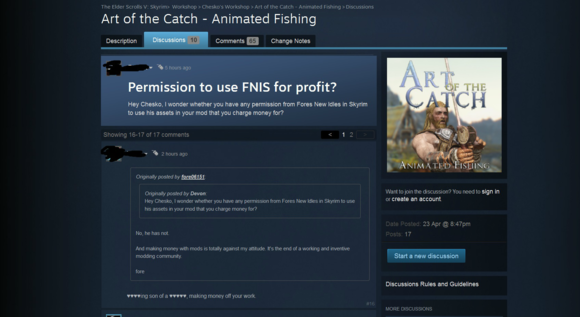 One of the mods Valve used to promote the new paid mod system was called Art of the Catch, authored by longtime modders Chesko and aqqh. The problem? Art of the Catch used assets from another prominent modder, Fore. This wasn’t a conflict traditionally: All the work was given away for free anyway, so who cared if someone built off another person’s work? That screenshot started floating around the Steam forums, such as in this thread. 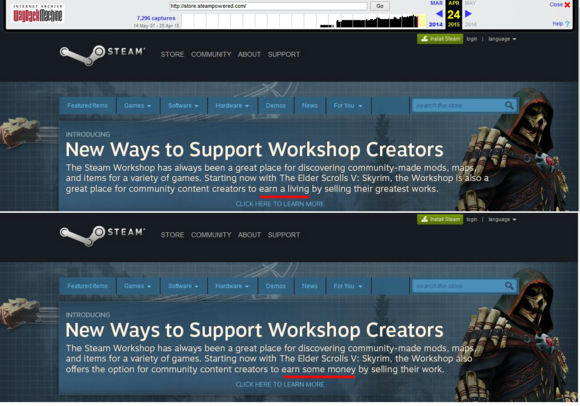 Interesting: Follow that link and you’ll see users claiming the screenshot surfaced from an account (Linear) that was subsequently banned by Valve (and, they argue, censored). “We were given about a month and a half to prepare our content. 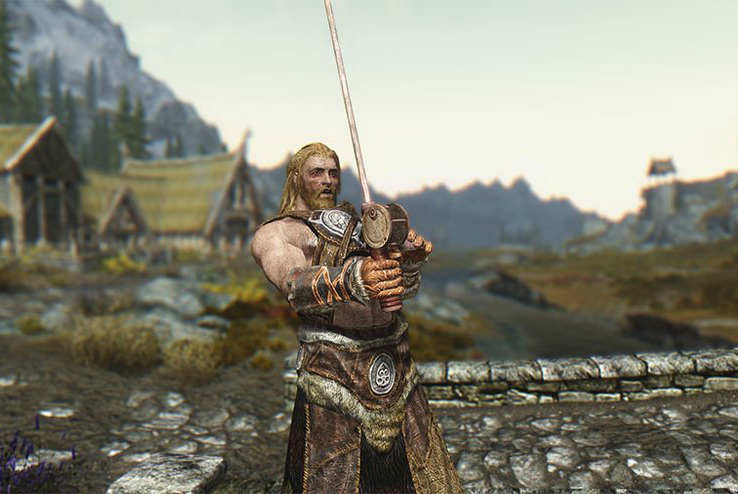 As anyone here knows, large DLC-sized mods don’t happen in a month and a half. During this time, we were required to not speak to anyone about this program. 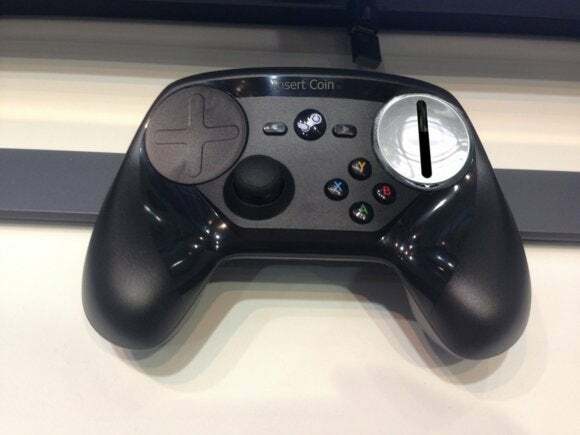 And when a company like Valve or Bethesda tells you not to do something, you tend to listen. I knew this would cause backlash, trust me. But I also knew that, with the right support and infrastructure in place, there was an opportunity to take modding to ‘the next level’, where there are more things like Falskaar in the world because the incentive was there to do it. Things internally stayed rather positive and exciting until some of us discovered that “25% Revenue Share” meant 25% to the modder, not to Valve / Bethesda. This sparked a long internal discussion. My key argument to Bethesda (putting my own head on the chopping block at the time) was that this model incentivizes small, cheap to produce items (time-wise) than it does the large, full-scale mods that this system has the opportunity of championing. It does not reward the best and the biggest. Art of the Catch wasn’t the last mod to go. Other developers, afraid their work would get stolen and monetized against their will, started pulling their free mods off the Skyrim Nexus. 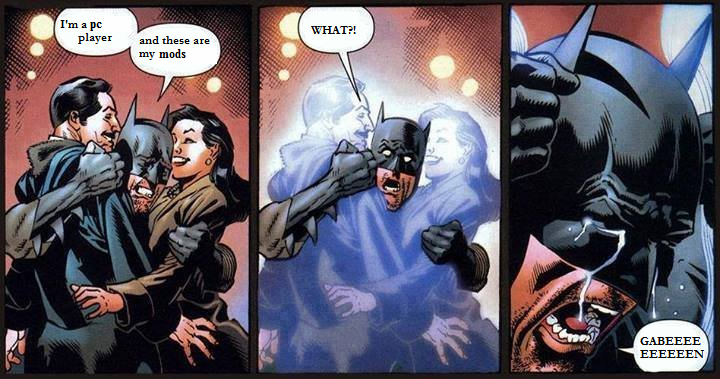 And then the war of the mods began in earnest. 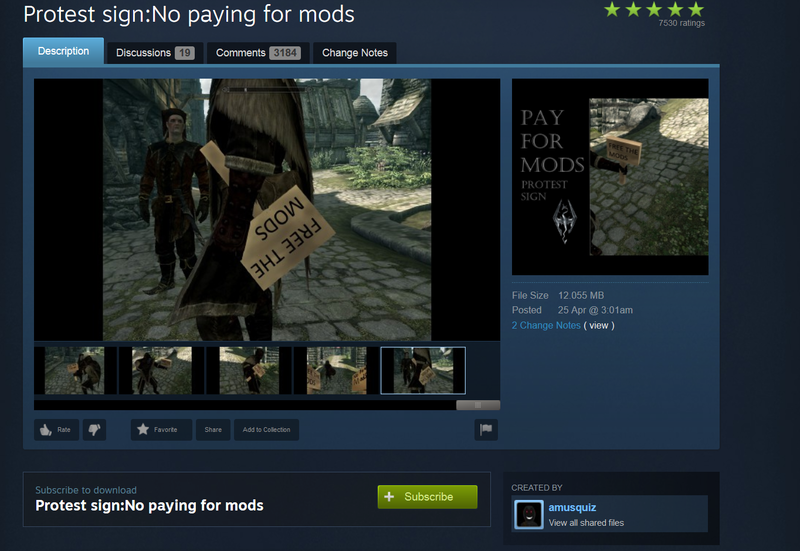 On the paid mods side, you had developers literally inserting pop-ups into the free versions of their mods in order to try and force users to pay for the premium version. Scummy. Garry Newman, creator of popular mod-this-platform-to-do-anything game Garry’s Mod called the mod community some mean things. But if Gabe Newell’s Reddit adventure was supposed to help, it hasn’t as of yet. As I write this article late Sunday, Skyrim’s Steam review average has plummeted from 98 percent (before this debacle) all the way down to 86 percent. That may seem inconsequential, but on a title this old it’s a huge drop and a decent representation of user anger—albeit a wholly pointless form of protest. There’s also this Reddit thread where a user demonstrates the poor quality control of Skyrim’s current crop of paid mods—glitched items, glitched doors, clipping, et cetera. These sorts of problems were forgivable when mods were free. In paid items? It’s absurd. It’s a mess, and honestly one that shows no sign of abating yet—surprising, considering most Internet drama seems to come and go in a matter of days. The PCMR subreddit is particularly volatile at the moment though, and some users are even discussing creating their own launcher. That’s...fairly serious. Also a ton of work. 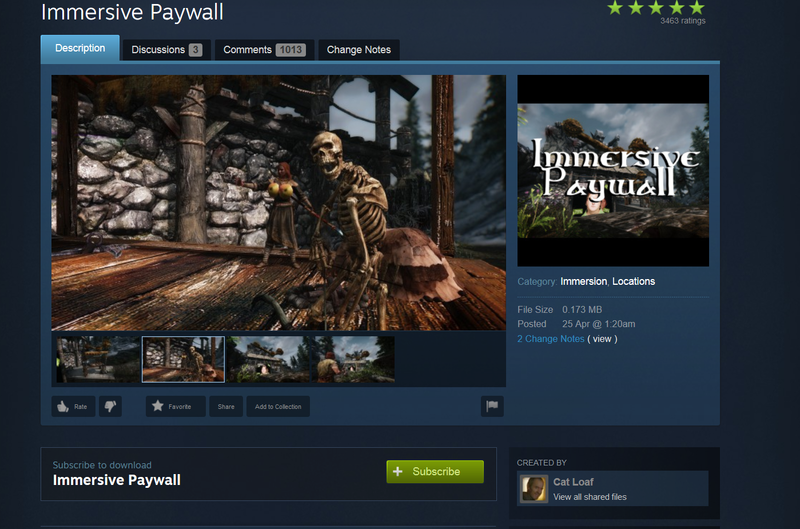 I don’t think you can quantify how much damage this whole morass has done to both the Skyrim community and Valve’s reputation, though. 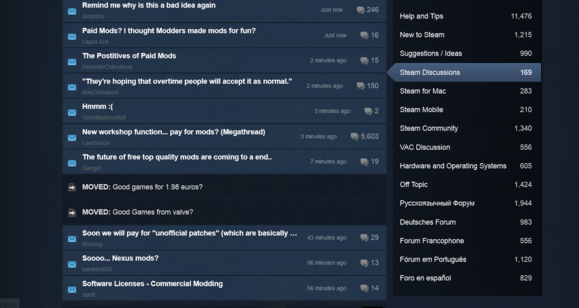 Even if Valve wins out and paid mods become the norm, I have a feeling this whole mess is going to haunt Steam for a while. It’ll linger, the way people still bring up when Call of Duty ditched dedicated servers, or Ubisoft forcing Uplay, or the pile of garbage that was Games for Windows Live. We’ll keep you updated as this whole thing progresses. Primary image courtesy of Reddit user weclock and this thread.